Neil Custis believes Manchester City are favourites in the race to win the Premier League with the weight of history hanging on Liverpool after 29 years without winning the domestic title. Liverpool's 29-year wait for a domestic title means they are under greater pressure than Manchester City in the race for the Premier League, according to Neil Custis. The Reds beat Bournemouth 3-0 on Saturday to move back ahead of City on goal difference ahead of their clash with Chelsea, live on Super Sunday. It is now 34 Premier League home games since Liverpool last tasted defeat, winning 24 of them, but while Tottenham and Chelsea still have to visit Merseyside, there is a growing sense that it will be away from Anfield where the title race will be decided. Jurgen Klopp's side travel to face Manchester United live on Sky Sports on February 24 while they also have the derby against Everton at Goodison Park at the start of next month. 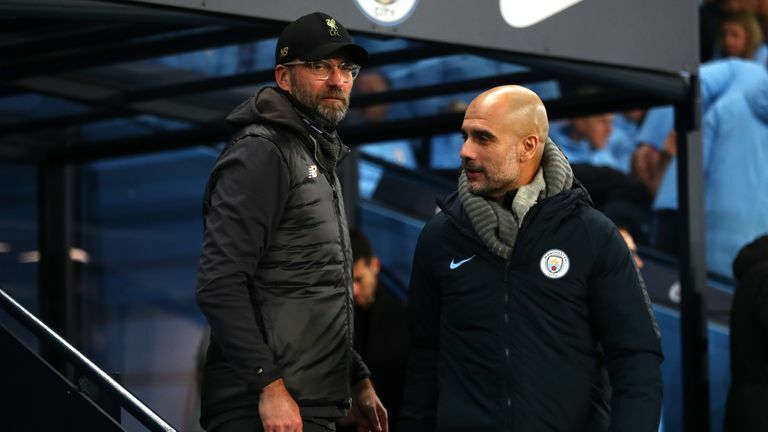 Liverpool came close to winning the Premier League title in 2009 and 2014, and Custis believes City hold the upper hand given their pedigree and track record of winning trophies under Pep Guardiola. He told the Sunday Supplement: "The pressure on Liverpool is huge, and I think in the end, City are going to win this, and they're going to win it by six points maybe. They've got more strength in depth. The argument that they've got more games to play I don't think works against them. "I think you get on that run, and it can all work in your favour - you look back to United in the Treble season when they were playing every three days, and you talk to players then about it and they say it was perfect, because they just couldn't be stopped. "I think City will look back at that Newcastle game as the one which changed it for them. That was the night they were playing on auto-pilot believing they could just go out and win it without putting the effort in, but you've got to match the opposition for desire even if you have the better players. "I think City will look back at that Newcastle game as the one which changed it for them. That was the night they were playing on auto-pilot believing they could just go out and win it without putting the effort in." "That will be the game that changes it for City as I don't think they'll make that mistake again. Having Sergio Aguero fit and firing again is the major plus-point, because he's the greatest foreign player ever to come to the Premier League. "You've got a core of players who've done it, won it in the past and know what's needed to get over the finish line and win. "We know how the pressure on Manchester United to get that first title after 25 years, and how they collapsed towards the end when Leeds won it, Liverpool have also done it under Brendan Rodgers, I think that's huge and that puts more pressure under Liverpool every game than City." 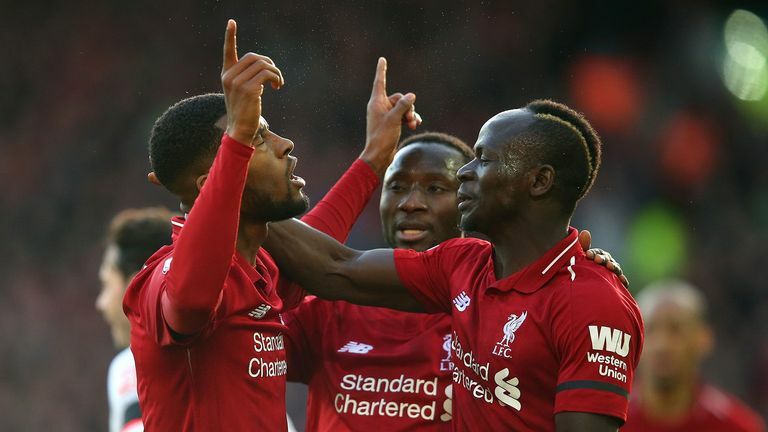 Georginio Wijnaldum's sublime finish in the 3-0 win over the Cherries was the first time in the Premier League since Boxing Day that a player other than Mohamed Salah, Sadio Mane or Roberto Firmino scored in the Premier League. The Independent's Jack Pitt-Brooke believes Liverpool had been grinding out results for a period before the recent draws with Leicester and West Ham, believing they have shown an over-reliance on Salah, who now has 17 league goals this season. "City's high level is probably higher than Liverpool's, and it'll be a case of them having to grind it out for the rest of the season," he added. Highlights from Liverpool's win against Bournemouth in the Premier League. "I was there on Monday against West Ham at the London Stadium, and Manuel Pellegrini said they only created two chances, and both were offside. "Firmino was barely in the game at all, so clearly something is a bit lacking and they're very reliant on Salah as an individual. "I was at the Brighton game a few weeks ago and it wasn't that different to the game against Leicester, only Salah won a penalty which got Liverpool off the hook. There's an over-dependence on him, and a lack of creating chances so that's something they're going to have to solve if they're going to keep it up."